182 pages | 1 B/W Illus. 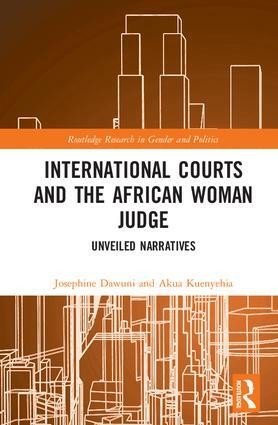 A sequel to Bauer and Dawuni's pioneering study on gender and the judiciary in Africa (Routledge, 2016), International Courts and the African Woman Judge examines questions on gender diversity, representative benches, and international courts by focusing on women judges from the continent of Africa. Drawing from postcolonial feminism, feminist institutionalism, feminist legal theory, and legal narratives, this book provides fresh and detailed narratives of seven women judges that challenge existing discourse on gender diversity in international courts. It answers important questions about how the politics of judicial appointments, gender, geographic location, class, and professional capital combine to shape the lives of women judges who sit on international courts and argues the need to disaggregate gender diversity with a view to understanding intra-group differences. International Courts and the African Woman Judge will be of interest to a variety of audiences including governments, policy makers, civil society organizations, students of gender studies, and feminist activists interested in all questions of gender and judging. Josephine Jarpa Dawuni is an Assistant Professor of Political Science at Howard University, Washington D.C. Her areas of research include judicial politics, women and the law, international human rights, and women in the legal professions. She is the editor (with Gretchen Bauer) of Gender and the Judiciary in Africa: From Obscurity to Parity? (Routledge, 2016). Hon. Judge Akua Kuenyehia served as a judge of the International Criminal Court (ICC) in The Hague, Netherlands from 2003-2015 and was elected First Vice-President of the ICC. Prior to the ICC, she was Dean, Faculty of Law of the University of Ghana.